In our “What your money is doing” series, we highlight things you support when you bank with Vancity. Credit cards and the environment are topics that don’t often get paired together. After all, credit cards are generally linked to buying and consuming more stuff. And, at the end of the day, that’s the behaviour that makes money for credit card companies. So why would a credit card company encourage its customers to consume less? At Vancity, we based our decision-making on a triple-bottom line approach. That means considering our impact on people, planet and profit. As a co-operative, we also focus on what’s in the best interest of our members and their communities. That’s why we distribute 5% of the profits we earn through our Vancity enviro™ Visa* cards back to the local community through the Vancity enviroFund™ every year. Since 1990, cardholders have helped raise $8.6 million for local sustainability initiatives. Recently, the Vancity enviroFund launched a new five-year focus on lighter living. For us, lighter living is about creating more sustainable communities by consuming less and wasting less, and living and sharing more. We believe there is a lot we can gain through lighter living, in addition to the obvious long-term benefits of preserving the earth’s resources for future generations. We know that our ecosystems cannot handle our current consumption and production patterns. Globally, more than 65% of carbon emissions associated with the earth’s warming are attributed to household consumption. This includes all the things we buy and have in our homes, as well as the water, food and energy we consume. The recent City of Vancouver Lighter Footprint report states that Vancouver residents use about three times more of the earth’s resources than our fair share. That means if everyone lived the way we do, we’d need more than three planets to sustain us. You can calculate your own ecological footprint to see how many planets we’d need if everybody lived like you. When we surveyed members, they also connected lighter living with psychological well-being. Lighter living can help you focus on enjoying your life, and spending your time and money on things that really matter to you. And there’s a strong connection between lighter living and money. Consumer debt is a huge issue in this country and lighter living is one strategy for dealing with overspending. It’s a no brainer – when we buy less, we save money. Lighter living not only takes a stand against the throw-away culture that consumerism has created, it also helps preserve our finances for the more important things. What initiatives are we supporting? Green Bloc Neighbourhoods is a program that fills the gap between individual level and city-level change. It helps communities takes collective action on climate change and resource consumption. Cascadia Wedding Show is BC’s first sustainable wedding show. It is committed to providing future brides with a range of sustainable vendors to choose from and educating on the environmental impact of the wedding industry. Gomae is Vancouver’s first zero waste food delivery system. It is partnered with local, plant-based restaurants across Metro Vancouver. Unbuilders is Canada’s foremost deconstruction company. It unbuilds homes by hand and salvaging almost everything, including irreplaceable old growth lumber, window, doors, cabinets, fixture and appliances. Quupe (pronounced “koop”) is a Vancouver-based sharing economy platform. It is building a robust user-referral system that will allow users to refer their friends to Quupe, and eventually also to other values-aligned local businesses in the sharing/zero-waste space. If you are working on a project that will help us all reduce our impact on the environment and gain more of what matters, please visit Vancity enviroFund to apply for funding. 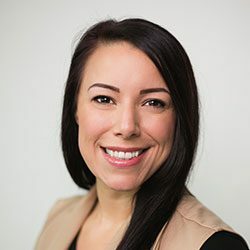 Krista is a Specialist at Vancity in the Community Business and Investment department. She’s passionate about social and environmental justice, and believes in the power of collective action. Krista loves wine, sunsets and spending time in nature.